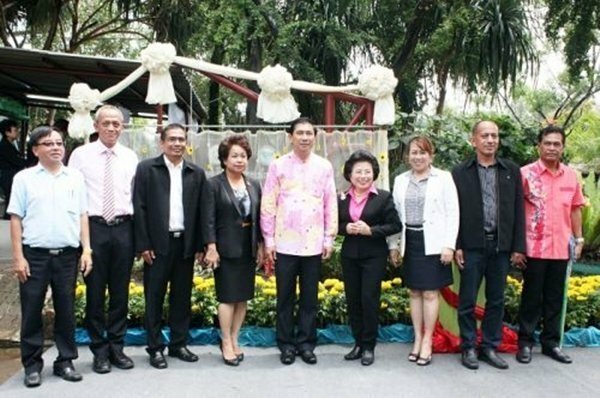 All Posts in "Green Living"
On 12th November 2014 at the meeting room of the Phuket Municipal Solid Waste Incineration Plant, Phuket Governor – Khun Nisit Jansomwong presided over a committee meeting on waste management and waste water. The meeting also saw Phuket City Mayor – Khun Somjai Suwansupana, Phuket Natural Resources and Environment Office Chief – Khun Kasem Sukwaree and Dr. Pornsri Suthanaruk – Director of Phuket Regional Environmental Office 15 in attendance. 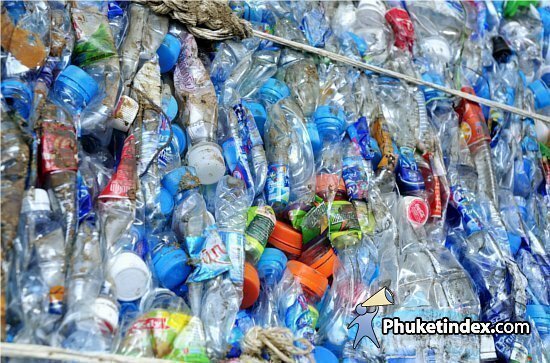 The most important item on the meeting’s agenda was to consider the proposals for a project to improve Phuket’s garbage landfill space which will see private companies purchase 1 million tons of garbage over a 3 years period which will be turned into fuel. Also discussed were solutions to solve waste water problems at the canals in Phuket town and the surrounding area. It was agreed that connecting waste water pipes should installed in the areas of Tambol Rasada, Baan Samkong and Soi Paniang which should take the waste water to the nearest waste water treatment centre. The project will cost in the area 60 million baht. 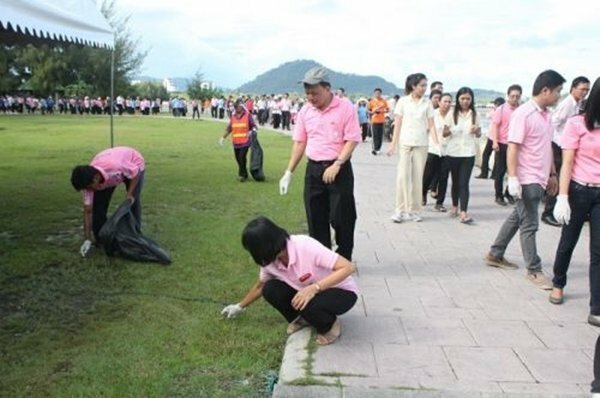 A team of government officials led by PPAO Chief Administrator Watcharin Pathomwattanapong took part in a public thrash cleanup activity, held at Sapan Hin Park on November 4. The event was presided over by Phuket Governor Nisit Chansomwong. Considered a gift to the King, whose 87th birthday falls on December 5th this year, the event also aims to promote unity among government agencies, private sectors and the public at large, establish social discipline where cleanliness and thrash are concerned, and encourage the public to reduce litter and seriously consider recycling, all in the name of the environment. 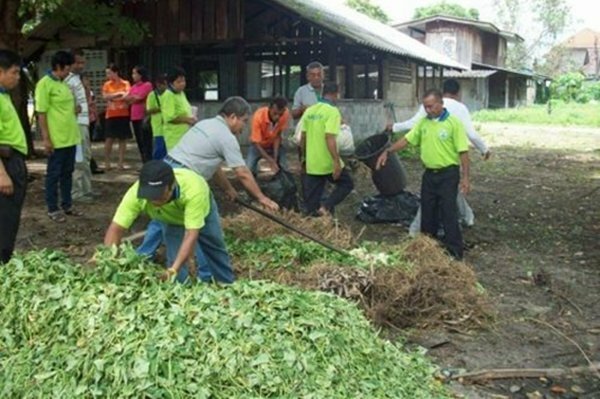 The cleanup also broadcasts the roles played by government offices, private businesses and local networks that campaign for the town cleanliness. 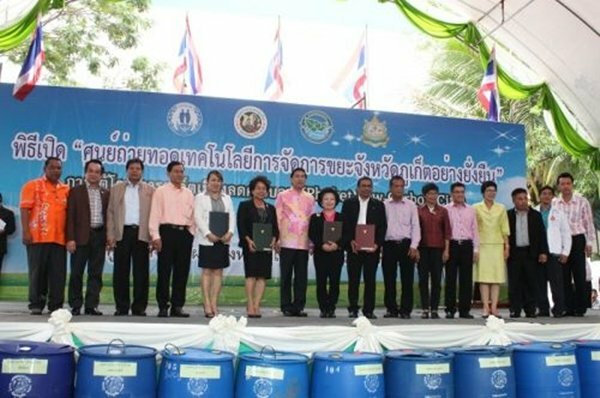 The event, entitled “Clean City, Happy People: (Muang Sa-ard Kon Nai Chart Meesuk), received support from many sectors including government, private, social network, students, hotel operators, tourism operators, traders, associations, clubs, vocational groups, housewives groups, village health volunteers, community leaders who all lent a hand. Altogether, 1,000 participants took part. 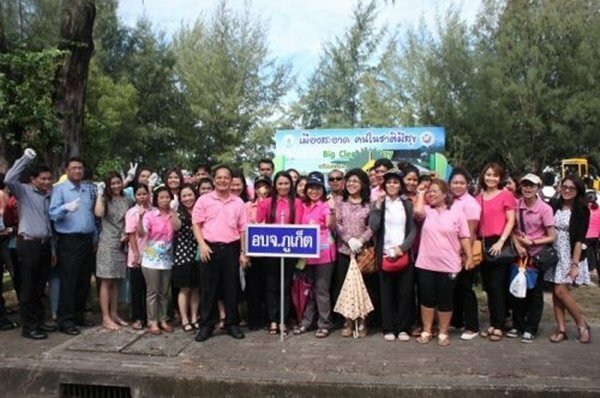 Phuket City Municipality was tasked with site preparation and looking after participants. 4. Establish the public discipline in relation to a sustainable refuse management. The Governor expected that the Road Map will result in a better environment. 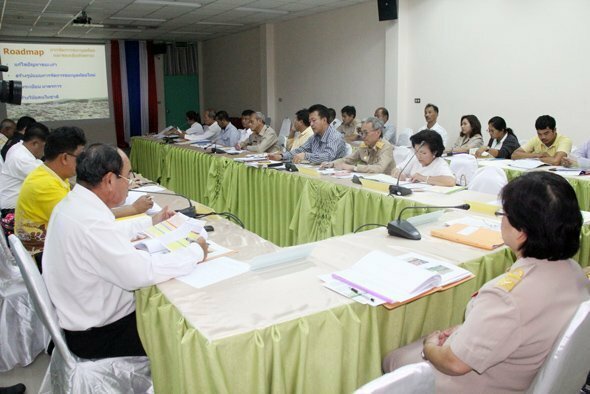 On 29th September 2014 at the conference room at Phuket Municipal Solid Waste Incineration Plant, Phuket Governor – Maitree Intusut presided over the third meeting for the solid waste and waste water management committee of 2014. Also present at the meeting were Phuket Vice Governor – Sommai Preechasil, PPAO Director – Paiboon Upatising, Phuket City Mayor – Somjai Suwansupana and Director of Regional Environmental Office 15 – Pornsri Suthanaruk. The main point of the meeting was to appoint a government agency to take full responsibility for correcting the island’s problems with waste and waste water. At present, there are a number of environmental issues which are affecting Phuket which are growing more serious and affecting a larger number of people. In fact, a large number of tourists have now started to complaint more frequently especially with regards to the releasing of wastewater into public areas in areas including Samkong, Karon and Cherng Talay. A further issue of concern is regarding pollution control of the waste building up at the Phuket incinerator. 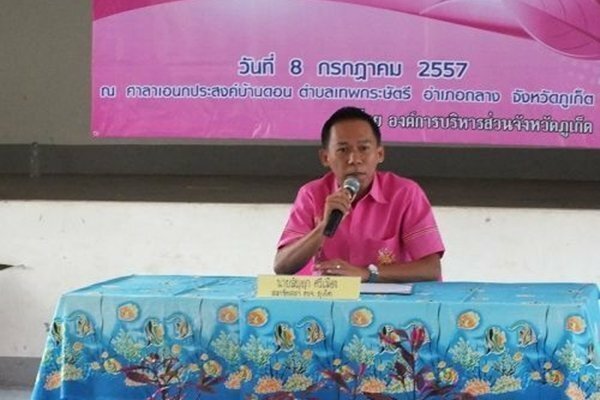 The Pollution Control Department has prepared a road map to use as a guideline in order to solve the problem of solid waste in Phuket, in particular the problem of waste separation which is rapidly becoming a urgent matter due to the fast expansion of Phuket with more Thais and foreigners visiting and living on the island and producing more waste. It is hoped that if everybody campaigns to reduce the amount of waste Phuket will have a better environment and more beautiful environment and will be able to welcome tourists for a long time. 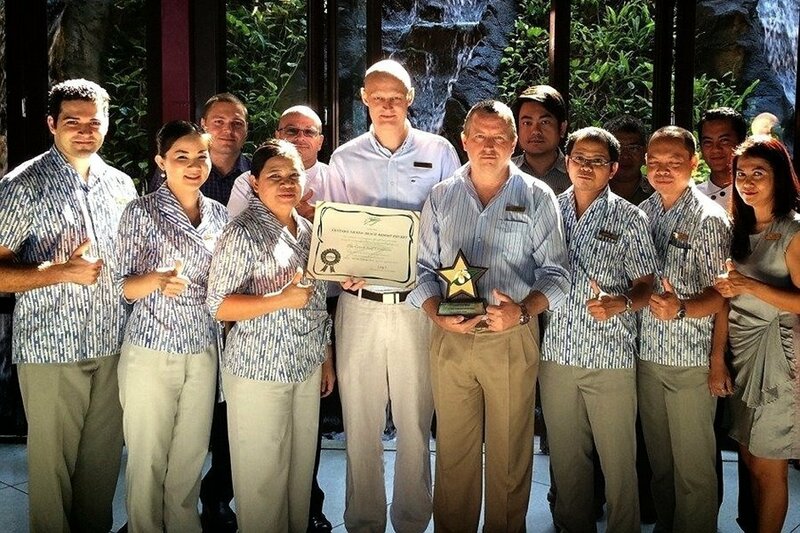 Darren Shaw – Area General Manager (middle in photo holding award), Michael Nielsen – Hotel Manager (middle in photo holding certificate) and the Centara Grand Beach Resort Phuket management team got together to celebrate “Centara Grand Beach Resort Phuket” recently receiving 2 awards for maintaining a green hotel (“Green Leaf Award”) and sustainable tourism (“Smoke Free Hotel”) from the Green Leaf Foundation, supported by Tourism Authority of Thailand and Action on Smoking and Health (ASH). The awards ceremony was held at the Grand Ballroom, Learning Center Building, Mahidol University, Bangkok. 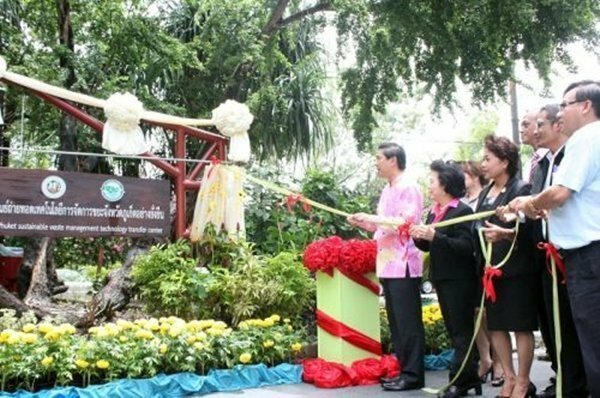 A new learning centre for sustainable organic refuse management has been unveiled in the area of the Phuket Incinerator on Tuesday September 16th 2014. 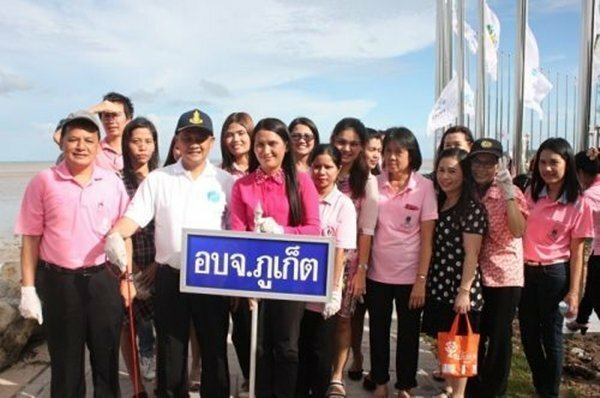 Governor Maitri Inthusut led officials and representatives from various government and environmental agencies including the Phuket Environment Foundation, at the launch. 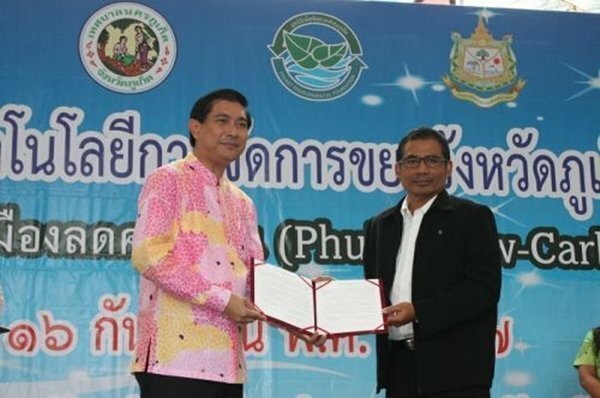 Officials also signed an MOU agreeing to support and adhere to the new organic waste management plans to drive the island toward becoming a low-carbon city (Phuket Low-Carbon City). PPAO was represented by Deputy Chief Executive Soratham Jinda. The learning centre provides information on various systems of organic household waste management including areas dedicated to subjects like: low-carbon know-how, compost making, liquid fertilizer, worm feed producing and biogas making. Also at the launch, a discussion forum on waste recycling also took place. Waste managers who successfully recycle rubbish recounted their experience and techniques as well as lending out household fertilizer-making tanks to those interested. The learning centre is open to the public. The attempt is seen as a concerted effort by the Phuket authorities to tackle the increasing amount of waste being sent to the local incinerator each day. Up to 680 tons of rubbish reaches the Phuket City incinerator which only has the capacity of 700 tons. However, it is discovered that half of the amount of the rubbish is organic household materials which can be recycled effectively and thereby reducing overall amount of waste. Other systems of waste management include landfill using areas of about 291 rai of land provided by the Forestry Department. 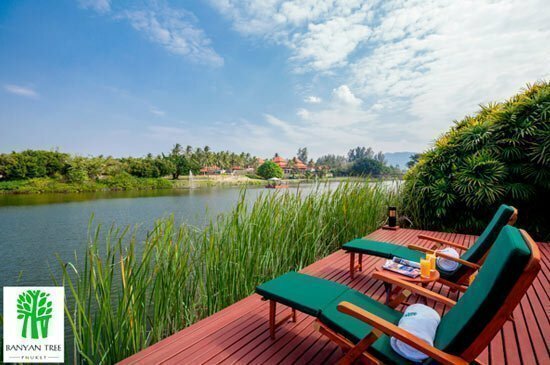 Banyan Tree Phuket and Angsana Laguna Phuket, the flagship properties of Banyan Tree and Angsana Hotels & Resorts, have been awarded the bronze status by EarthCheck, the world’s leading sustainable travel and tourism certification organisation, in recognition of the resorts’ high standards on sustainable practices. This achievement marks an important milestone for the two properties, following the second agreement signed in 2012 with EarthCheck by the Banyan Tree Group to maintain its commitment to the highest level of sustainable operations with a year-on-year performance measurement index. EarthCheck benchmarking and certification programmes assist businesses in the travel and tourism sector to monitor and reduce their environmental impact in core areas. The indicators are energy and water consumption, total waste production, community commitment, and the use of paper, cleaning and pesticide products; along with implementing an integrated environmental and social policy. 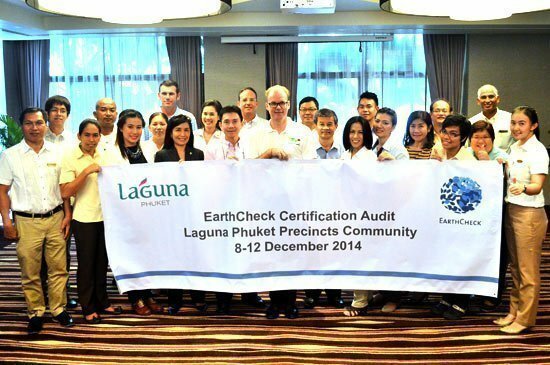 Banyan Tree Phuket and Angsana Laguna Phuket were awarded with the bronze EarthCheck Benchmarked status together with five other business units within Laguna Phuket, as part of the precinct of Laguna Phuket’s sustainability efforts. Building on existing sustainability campaigns, Banyan Tree Phuket and Angsana Laguna Phuket continue to put in place a number of initiatives to engage guests, associates and the local community, such as guest room and office energy conservation, recycling of materials, maintenance of an organic farm, and regular tree planting and beach cleaning activities. “Our aim is to provide both properties with quantifiable metrics to deliver bottom line efficiencies, maximise guest experiences and minimise our environmental footprint. We are delighted to receive this status and we look forward to maintaining and developing our sustainability efforts.” Albert Ocasio, General Manager of Angsana Laguna Phuket, added. 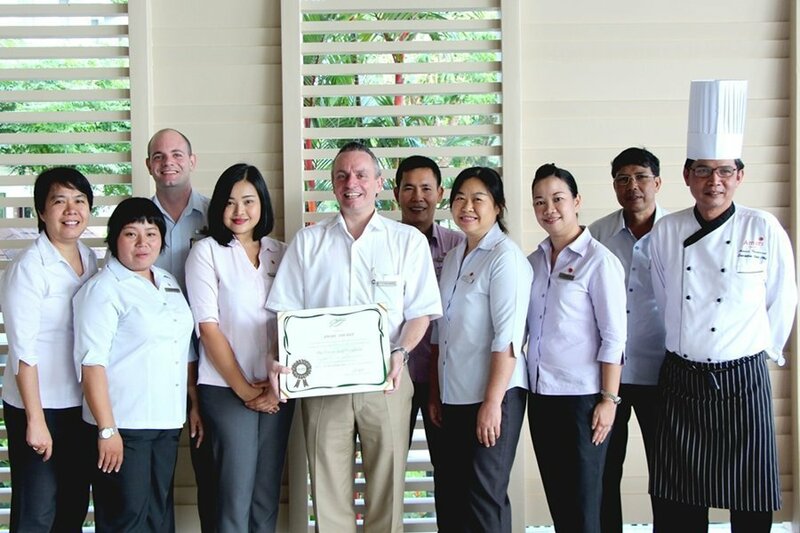 Amari Phuket recently received the Green Leaf Award from The Green Leaf Foundation, given to organisations that have excellent standards to maintain the environment. The management team, led by Mr Pierre-Andre Pelletier – Vice President & Area General Manager, South Thailand (front row – middle) celebrated proudly upon receiving the award at the resort’s Samutr Bar. 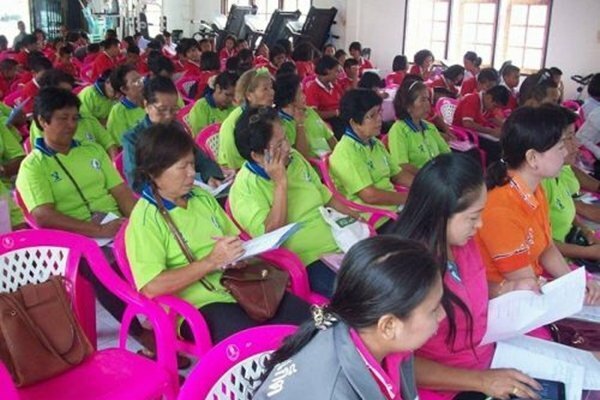 A training course on environmental management was delivered to volunteers from the Natural Resources and Environment Conservation Network and a number of school children at Tambon Thep Kasattri, Thalang on July 8th 2014. PPAO Council Member – Sanya Srimueng presided over the opening of the event, which also saw Council Members – Sithichok Detchpibal, Kamron Panthip and Sonthaya Suntharak, as well as Head of Engineering Department – Wassana Sriwilai, PPAO officials and guests in attendance. The sustainable environmental training course was organized jointly by PPAO, Phuket Natural and Environmental Resource Region 15, Phuket Environment Foundation, Natural Resources and Environment Conservation Network of Thalang and Thep Kasattri Schools, and saw 50 volunteers and 100 school children participate. The training covered both theoretical and practical aspects of sustainable waste management and includes modules such as: environmental report on local rubbish and wastewater, sorting rubbish, sustainable waste treatment, and sorting banks, among others. In the practical modules, the participants were divided into groups that focused on making compost from leftover fruits, vegetables, food and manure, all using a high temperature burning process which gives the by-product of wood vinegar. 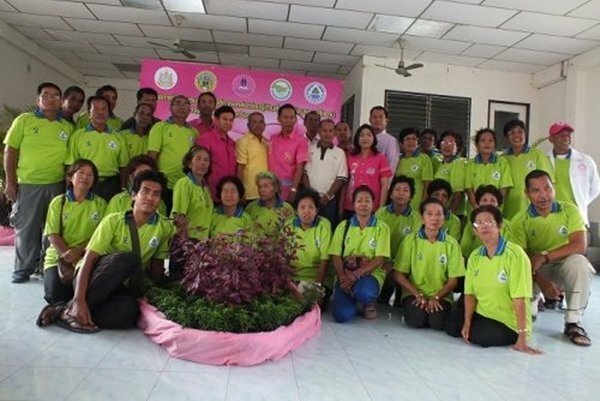 According to Mrs Wassana, the training program aimed to educate volunteers of the Natural Resources and Environment Conservation Network and schoolchildren from three Phuket districts in sustainable waste management. It was also hoped that “graduates” will continue to train members in their communities to do the same, thus creating a network of groups which work together to reduce local refuse. According to Mr Sanya, Phuket now recycles over 680 tons of refuse daily, 60% of which is organic materials. Effective refuse management will raise environment awareness among the public and encourage them to take part in the process by starting to sort out organic materials at home. Mr Sanya believes the program not only decreases the amount of rubbish inundating Phuket but also helps to reduce many forms of environment impact. 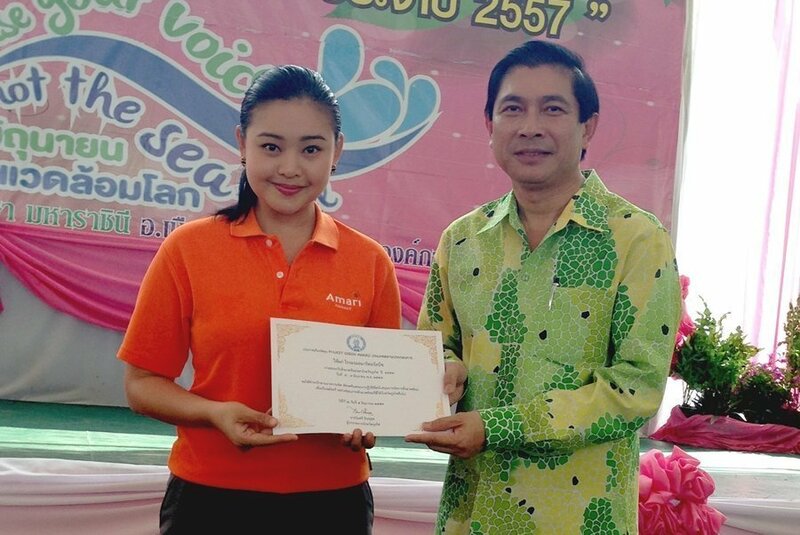 Ms Rinrapat Puwanutchotchai (Director, Human Resources) recently acted as a representative of Amari Phuket to receive the Phuket Green Award 2014 from the Governor of Phuket, Maitree Intusut. The Phuket Green Awards are intended to highlight, and further promote Phuket’s dedication to the conservation of its island’s precious natural and cultural resources and support sustainable tourism development in tandem with the growing concern we all have for our planet. 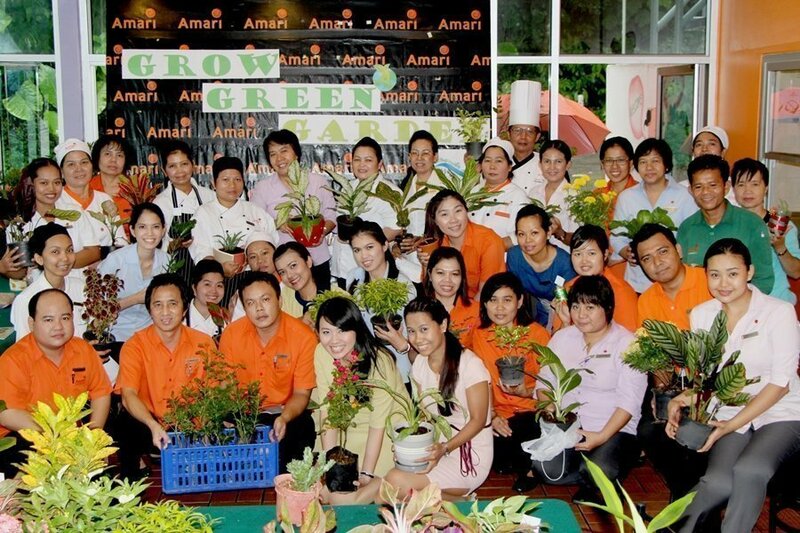 Amari Phuket recently held activities to support the World Environment Day 2014. Team members were invited to experience the ‘Grow Green Garden Project’ and donated their own plants. There were 88 different plants collected from this event and they will be donated to the Baan Kalim School for creating a garden as well as the preservation of nature.